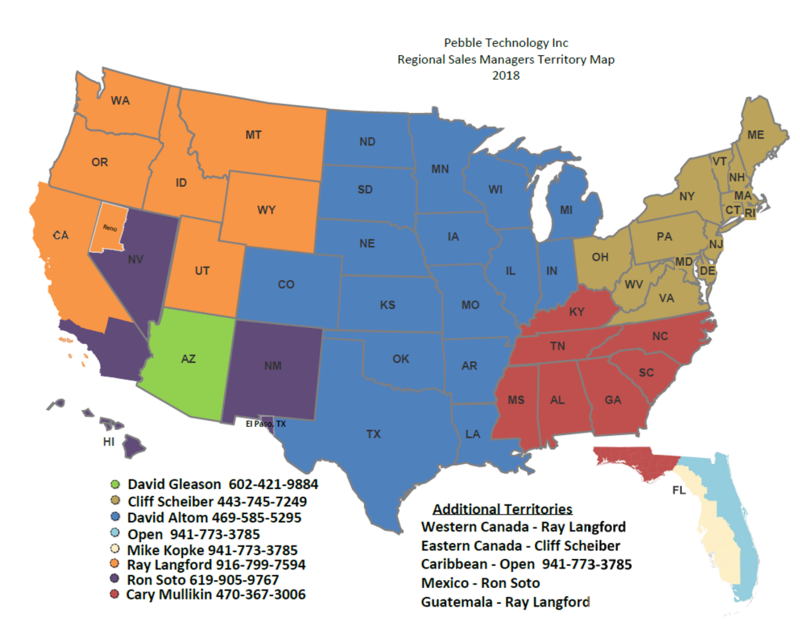 Below you can find your regional sales person's information. Please feel free to reach out to them directly, or fill out the form below and we will pass your informaton on to the appropriate person. Connecticut, Delaware, Kentucky, Maine, Maryland, Massachusetts, New Hampshire, New Jersey, New York, Ohio, Pennsylvania, Rhode Island, Vermont, Virginia, West Virginia & Eastern Canada. Arkansas, Colorado, Illinois, Indiana, Iowa, Kansas, Louisiana, Michigan, Minnesota, Missouri, Nebraska, North Dakota, Oklahoma, South Dakota, Texas & Wisconsin. The material contained within this website that includes all names, logos, photographic images, text, and trademarks is the property of Pebble Technology International, Copyright© 2018 Pebble Technology, Inc. All rights reserved. Reproduction in whole or in part without permission is strictly prohibited.